A feeling is but a fleeting thought jetpacking through our inner universe. A feeling is but a fleeting thought that we think with every morsel of our being. The point is this: feelings, no matter how strong they seem, come and go. They don’t stay…unless we want them to. Feelings of anger, sadness, jealousy, and resentment can set up shop in the deep nooks of our souls and latch onto every bit of who we are. We can let go of such feelings. And we don’t have to be defined by them. What feelings are you holding onto? Which ones do you know you need to let go? Sounds strange, but even happy feelings need to be let go. Even they don’t stay. This week, let’s practice acknowledging our feelings and accepting their impermanence. 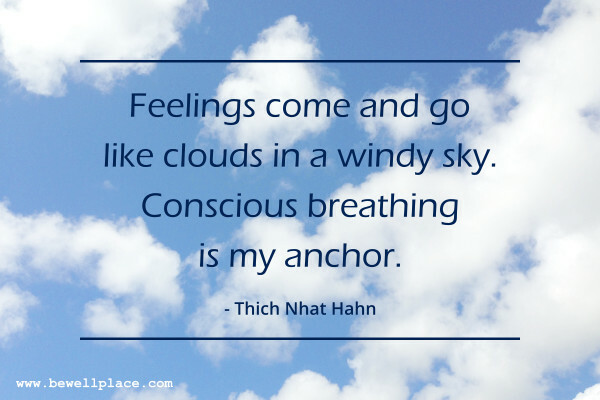 When a strong feeling comes on, let’s take a few deep, conscious breaths – inhaling tranquility, and exhaling all that does not belong inside of us. The more we shift our focus from that which is fleeting, the more at peace we will be.